Hello everyone! Time for another round with the Bitchy Barista. Since my last post was so well received, I've decided to continue randomly posting about my coffee experiences and hopefully help readers out along the way! So Katie asked me to explain cup sizes in the last post, and that's exactly what I'm going to do. It happens almost every time someone new is ordering their coffee. A pause ensues, as uncertainty for the correct term overcomes the customer. It's that simple. Our regulars always ask by the ounce terminology when ordering, which is a safe bet to use in any coffee shop. However, if you can't remember that, the fallback is to simply use small, medium, and large! Starbucks just wanted to add some Italian flair to their cup labels apparently, and it's taken hold around the world. Does anyone else have some questions about coffee? I'd seriously love to write these up and not only let them be mini rants, but be helpful ones! Haha, so any question, no matter how small you think it is, ask it in a comment below! wow and the large size is really large! Haha, bitchy barista - great name for that series!! They make things so complicated! HaHaHa Thanks Linda! That way is much simpler. 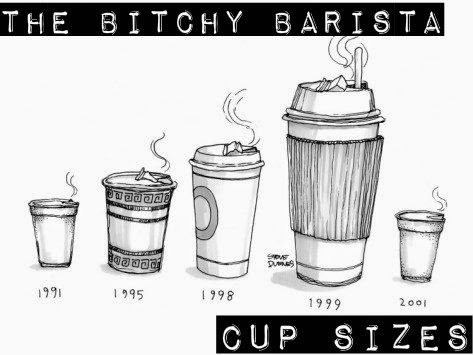 Haha I just ask for either a small, medium or large even at Starbucks. None of this tall, grande and venti terminology ;). Man, I love these posts. And that name still makes me giggle, because you are the total opposite of bitchy. Actually, I have a question! I want to know what drinks are the most annoying to make. You sure know your coffee well! And, for what it's worth, you don't sound bitchy at all. Lol. know & please keep in touch! I love these post of yours!